Buy Juki Sewing Machines And Quilting Machines that are not only lightweight but compact as well and available at a great price. Sewing machines help you to weave ideas into wonderful creations to decorate your homes and self. In today’s era, intelligent sewing machines have taken over the job of creating cutting-edge stitch patterns and designs. As you, all know there are many brands in this category, however only a few names strike a chord with the customer’s preferences. Juki is one such brand that produces world’s best quality sewing machines. In this article you can find the best selling “top five” Juki sewing machines models and top rated reviews from customers. Juki is proudly Japanese and one of the largest Original equipment manufacturer of industrial and home sewing machines/sergers. Juki was the brand that made Bernia sergers, singer xl150-6000 computer sewing, embroidery machines, and the Elna 9020. They started their operations in the year 1945, and they are still the dominating team in the sewing market. Juki is a reputed brand with worldwide recognition and it has a loyal customer base. Juki has a wide range of sewing machines and this brand continues to design every single product with the home-based sewers in mind. They have a set of computerized and quilting machines with innovative functions and stunning features. They have semi-industrial machines that include latest technologies. All the Juki products run at jet speeds making countless stitches with perfect precision. Their products are durable and capable of creating wonderful masterpieces out of various fabrics. The Juki HZL-F600 or the Exceed Quilt & Pro Special is one of the machines made for the household line with an industrial machine touch. This is a powerful and heavy machine with 255 sewing patterns and 4 fonts. It is great for quilting, creating and sewing into any kind of fabric. It can handle any kind of project with its solid frame and it has excellent customer ratings. It has a variety of patterns and stitches, which helps to decorate any sort of fabric. It has a large LCD display (33mm x 66mm) and a dial for easy pattern selection. This sewing machine displays highest quality industrial style buttonholes and that too of 16 types. It is large, wide and has a work surface area of 8” wide x 12 ¼ “. The work surface area provided is greater than average workspace of any other machine. This machine runs quiet and has incredible throat space. Definitely not for a beginner and not a flawless machine, however I must say it is a great pick for professional sewers. This sewing machine is a brilliant masterpiece from Juki! Solid body and has many handy features. I love the drop in bobbin, automatic needle threader and the foot pedal that will cut the thread when pressed with the heel. It saves time and has excellent features. If you are not sure how to use this then you can rely on the instruction manual or watch YouTube videos for easy use. It works quietly and stitches easily through the denim layers without any hitch. I love sewing with this machine and is worth for every penny spent. The Juki TL-2000Qi is a single needle, lock-stitch machine that does extremely well at straight stitching. If you love to create your own designs for home décor, tailoring and dress making then this machine is a great pick. With a maximum speed of 1500 stitches per minute, you can do great quilting, dressmaking and home décor jobs. There is a large sewing table with a thread trimming foot switch and a presser foot- knee lever. It is sturdy and a reliable machine that flawlessly runs during a straight stitch. It has an automatic thread trimmer and a needle threader. For those fed up with bobbin replacements, you can actually settle down and relax with this machine. This machine easily sits over a tabletop or mounts into cabinets and on quilting frames. It has a built-in carrying handle and is portable. It has power, enduring body, and incredible speed. This machine comes with great LED lighting features and an extension table for large projects. If you like, the drop-in bobbin style then you will be disappointed as it has a hook style bobbin. Again, this machine has excellent ratings and is one of the best sellers at the Amazon. I splurged on this after a lot of research and I must say that it has a great speed and high quality. This machine works extremely well and exceeded expectations. I am an avid quilter, this machine stitches like a pro, and I love this. If you are on the lookout for a perfect machine for large projects then look no further. It has a dial for easy pattern selection and sensor buttonholes. It has a combine and sew away feature. This machine operates at various speeds and has bright LED lights to accompany while at work. It comes with a hard shell carry case. The needle is perfect and stitches precisely. This machine can handle multiple layers and heavy materials just like that. You can stitch heavy fabrics for handbags, jeans, and canvas kind of materials. This machine performs wonderfully and does all the work for you. This computerized machine helps you to choose the operation you want to perform and even helps you to do lettering easily. Most of the home sewers love this machine as it performs better and works brilliantly just like the industrial machines. You can get your over locks and patterns with great finish like never before. This machine has everything that you need and you will have lesser complaints compared to any other sewing machine. I bought my machine from a fair about a year ago. I am a not an expert sewer and I know sewing basics from my mother. I ordered this Juki after reading reviews. With the help of the DVD and the manual, I was able to figure out everything. I am slowly learning and I have stitched few frocks, hats, mittens, and pillowcases with total ease. It sews beautifully and I love the all the features. It is totally worth spending. HZL 27Z is a lightweight portable sewing machine with a total 22 stitches and a buttonhole. It comes with an automatic needle threader and an easy stitch change dial. This machine has a drop-in bobbin case and has LED bright lights included in the work area. This machine is free arm and runs swiftly into any kind of fabric. The main highlight of this machine is that it is has a reasonable price and is affordable for the common lot. This machine is perfect pick for beginners, but it could have been better with additional features like stop and start button. It has a variety of stitches and offers flexibility. However, you do not have the option to control the speed. This is the least priced machine from the Juki family and great for people who are new to sewing and want a low priced version. Even though this machine has reduced features, this one is selling huge and loved by customers for the affordability factor. This is a basic sewing machine and has simple features to offer. I have tried many cheap priced machines but nothing worked this good. Juki is perfect and they offer excellent customer service. I will give it five stars and it is a great machine for crafting. This is a computer controlled household sewing machine that is fun and easy to use. It weighs 15.6 lbs and sews faster than full size sewing machines. It is smooth and does its work quietly. The stitch quality is superior and comes with a start/stop button with luminous color status. It has a reverse stitch button and easily adjusts stitch lengths/widths using a simple lever control. It has 15 needle positions and sensor buttonholes. It has 150 stitches and includes 100-character font. It easily stitches a variety of patterns in any kind of fabrics and allows automatic needle threading. For those who love quilting just drop the dog feed and have a free motion artistic quilting experience. Two lock stitch options allow decorating fabrics perfectly and precisely at place. You can adjust the tension settings automatically or manually. Follows a drop-in bobbin style and comes with a bobbin winder with regulator. This machine has nice stitches and programmable features. The lettering option is not perfect but overall this does well. It is not an expensive machine and works for long hours. For household needs this computer controlled machine works brilliantly. It sews like a breeze and does not make much sound. Juki is from the country Japan that produces high quality products in all fields. They have wide range of products with excellent features. There is a lot of room for every sewing need and available at affordable prices. There are expensive ones too with high-end features and they run flawlessly across the fabrics. 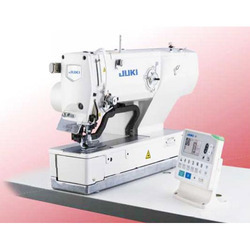 If you have plans to buy a sewing machine then Juki machines are a great choice to go with. These top five picks mentioned above are the favorite choices and best recommended by customers. They are worth buying and each penny you invest will not go in vain. Go for it and enjoy the thrill of creating new clothes and home décor items.